Over the Christmas break I ate a lot of sugar. This was not your run of the mill indulgence in Christmas cake and the odd box of roses, this was gluttony of the highest order. Mid way through the holidays I was forced to retire to bed due to ‘overdoing’ it with a certain banoffee pie, but this was not the last straw for me (it really ought to have been). The last straw came when I could not manage a second piece of stollen at the home a friend. I felt weak, shaky and nauseas – think it is referred to as a sugar hangover. This particular stollen hailed from a small family bakers in Germany and was exquisite. I was unable to take one more bite! I was done. I have talked on the blog before about my failure to find my sugar off switch and my belief that it is addictive (for some at least). Seems I am an early adopter for once as this view seems to be everywhere just now. So yet again I took the decision to ditch added sugar as much as I could. No sweets, cakes, chocolate or biscuits, as little processed food as possible (never going to ditch ketchup), and rejecting any food that has sugar in the top three ingredients. I draw the line on fruit – fruit is good for you and I can’t cope with the idea that fruit is in any way evil. Trouble is I find giving up these things harder than giving up smoking and harder than tackling a dry January, so roll in the substitutes! My favourite substitute ‘de moment’ is SAVOURY SCONES. They look cakey, they feel cakey and despite being savoury they taste sort of cakey. I got started with a fantastically simple recipe from www.bbcgoodfood.co.uk for Mediterannean Scones which were flavoured with olives, sun dried tomatoes and lovely crumbly feta. Served warm with lashings of salty butter these would be brilliant as part of a savoury spread of continental meats and cheeses, but also worked brilliantly on their own with a nice cup of mint tea and as a nice breakfast alternative. I was hooked! They take about 10 minutes to make, 20 minutes to cook and they taste superb. You can find the recipe on http://www.bbcgoodfood.com/recipes/1867/mediterranean-scones. Have you any other great ideas for savoury scones? Tell me and I will try them, I am on a roll. 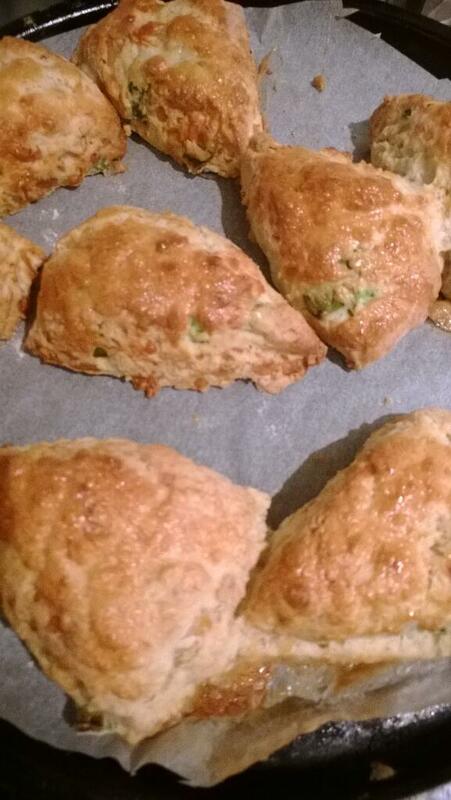 Categories: MUSINGS, RECIPES - BAKING | Tags: SAVOURY SCONES | Permalink. As you can see the site has changed a little bit. I am trying to go for something a little bit cleaner and brighter, something that makes my sometimes iffy photos look better perhaps. A lovely man called Paul worked on my banner, but they are all my pics (if not my cooking) which I am quite proud of. The fabulous chocolate brownie with prune ice cream is from Rufflets in St Andrews, a wonderful fish dish from Fishers in Edinburgh and of course Eggs Benedict from an infamous girls lunch at The Pantry. Hope you like the new look. So on with the blog. It would be embarrassing for me to issue another challenge to all and sundry, seeing as I failed my own 2013 challenge so spectacularly, however I have issued myself a little bit of personal challenge which I don’t mind sharing with you. My challenge is to cook more seasonally! To many of you that seems like pretty basic stuff but I am not very good at this. There are many seasonal wonders I shy away from – kale, beetroot and game to name but three and I am absolutely shameless when it comes to buying strawberries from Timbuktu in January if I so desire them. I was recently shamed by the wonderful Nicola over at http://www.eatwithoutwheat.blogspot.com who gets an organic fruit and veg box delivered and creates the most wonderfully creative dishes from purely seasonal produce. I used to get a vegetable box from a local farm but seemed to be left with enough carrots to feed Santa’s whole posse at the end of every week, then there was the aforementioned Kale which I would carefully consider and then try to forget about and lets not forget the weekly beetroot which was never cooked for fear of painting myself and the kitchen crimson. Seems I was just not willing to put in the effort so although I am not quite ready to go for the veggie box again I am prepared to delve into a bit more seasonal cooking. Broccoli, brussel sprouts, cabbage, carrots, celeriac, kale (of course), chard, Leeks, onions, parsnips, spinach, SPRING GREENS, winter squash, neeps, cauliflower, swede. I decided to play it relatively safe for my first seasonal foray and chose scallops and spring greens from my seasonal list. 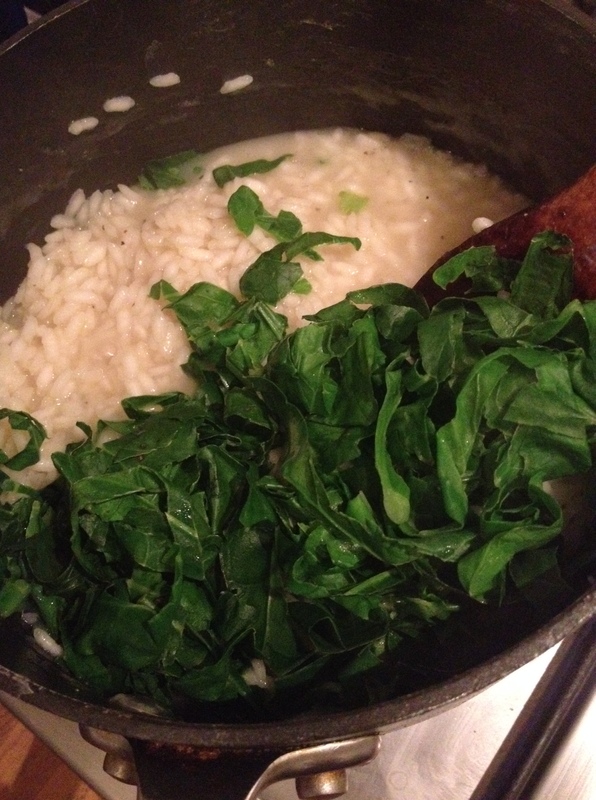 I love making risotto. Some find it laborious because it needs your undivided attention but this is exactly why I like it. 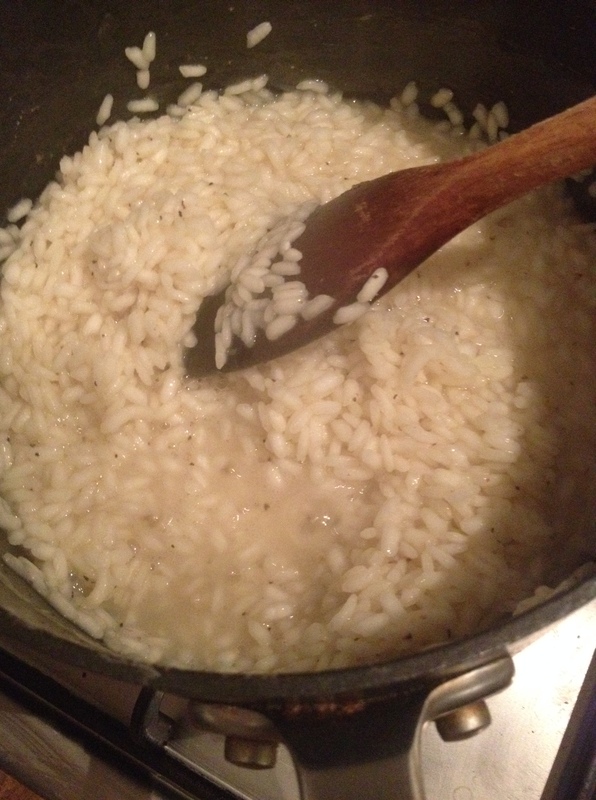 I often find it hard to concentrate on one task and often flit about making a half-arsed job of many things but risotto is another matter. It forces me to focus and I pretty much have a 100% success rate on a cracking dish. Perhaps if I could stay more focused on other things …..
New Years Eve ain’t what it used to be. In years gone by B and I would generally see in the New Year in a haze of fine and not so fine wine and be the last men standing at any party’s end. Now, with a lively three year old, the emphasis is more on fine food with great friends, a moderate amount of booze and a prayer that our hangover is not too hideous to withstand the onslaught of screaming children at 7am (optimistic I know) the following morning. This year was ALL about the food! We were hosting a small dinner party with the Pettinger-Thomsons and their two kiddos. I selected a menu which was very brave for me and raised an eyebrow from my other half. I love scallops but for some reason I have never cooked them. They are pricey little buggers which may be something to do with it! 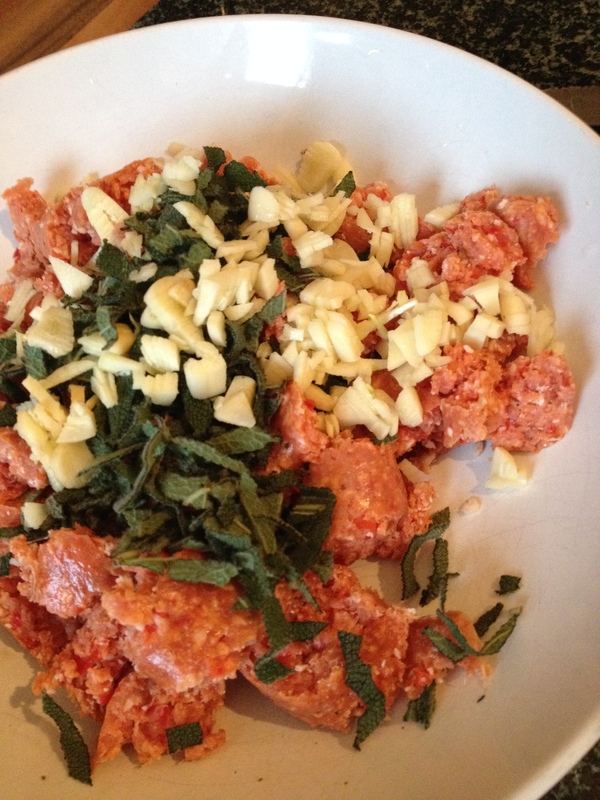 This recipe came from Gino D’Acampo’s new book ‘Italian Escape’. It is full of lush recipes that look stunning and seem simple to pull together. As promised by the lovely Gino, this starter was really quick to turn around on the night. I made the pea puree and pangritata ahead of time so all there was to do was some reheating and sizzling up those juicy scallops. It looked amazing and tasted fantastic. If you come to mine for dinner in the future, expect to be served this. I am queen of the one pot – chilli’s, hearty stews, fragrant tagines, mousakka and the like. I do not often attempt to cook a large hunk of meat and had never ever cooked pork belly before. My husband and family cried out – why put yourself through this?Cook something you are comfortable with! But nice as a hearty stew is – I didn’t feel that it was show stopping. 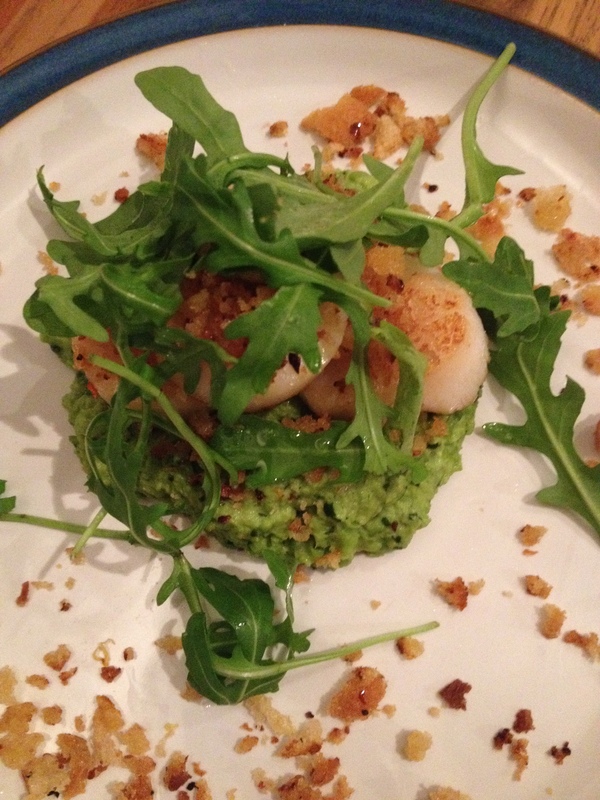 I had the pleasure of tasting this recipe at a very memorable dinner party in North Berwick. Memorable for many reasons, not least my consumption of copious amounts of limoncello: leading to bouncing off the walls and the worst (or one of) hangovers in history. I try to forget that part of the evening. What I have never forgotten however was the food. This was a meal that had me begging the cook to enter masterchef and the star of the show was this wonderful pork belly dish from Simon Hopkinson. It is possibly the most divine thing I have ever tasted . But could I cook something as well as Dave – the kitchen wizard? 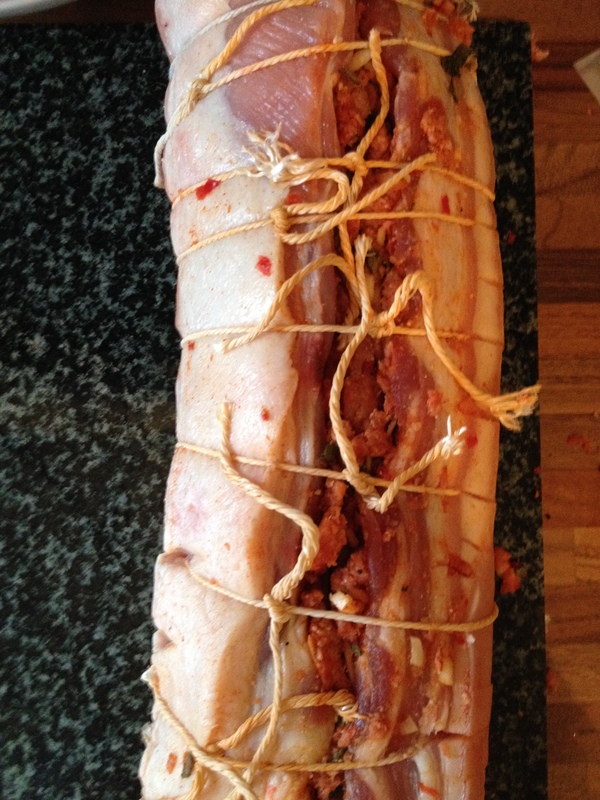 Armed with my pork belly and chorizo from Puddledub of Auchtertool, the cooking process began on the 30th. As most of the work is done the day before , it is a piece of cake on the big night. B might disagree with any suggestion that I was cool as a cucumber after almost being stabbed when daring to ask a question during a crucial moment in the creative process! Yes, there were some tense moments – rolling and tying seemed a little less straightforward that I was led to believe with quite some time spent chasing the filling around the work top and gamely poking it back into the pork roll. I also realised that actually having a large casserole dish with a lid might have been helpful. Instead the mammoth piece of meat with all of the gubbins that goes with it were squished into an over-sized lasagne dish and covered in foil. It was full to the brim and any movement resulted in a flow of juices onto the kitchen floor – you live and learn. I am critical of my own cooking and suffer from a lack of confidence once I serve up, leading me to making excuses for food that is basically very tasty. This may have been the first time that I sat down to a self cooked meal for friends and thought “bloody hell Haze, this is fantastic, how clever you are” Enough said really. At the risk of being sued under copyright rules I am giving you the recipe for the pork belly in its entiretity. I made not changes to it because to be honest it is the most perfect recipe I have made – tinkering would be a sin. The most excellent dessert (not photographed due to my phone falling asleep before midnight) was provided by Ms PT and was to die for. The toffee filling took you straight back to childhood – licking the spoon from the tin of condensed milk. The base was perfect and it was all topped off with maltesers. On the night this dessert was grand HOWEVER on New Years day I could not help but have two enormous slices of it on the back of demolishing the remainder of our champagne truffels. The sugar rush effect was quite drastic and I had to have a lie down (honestly I did!) . Not that this stopped me picking away at it after my recovery. Really this was a sublime dessert. All in all the meal was a triumph. Hell I would give it 10 out of 10! 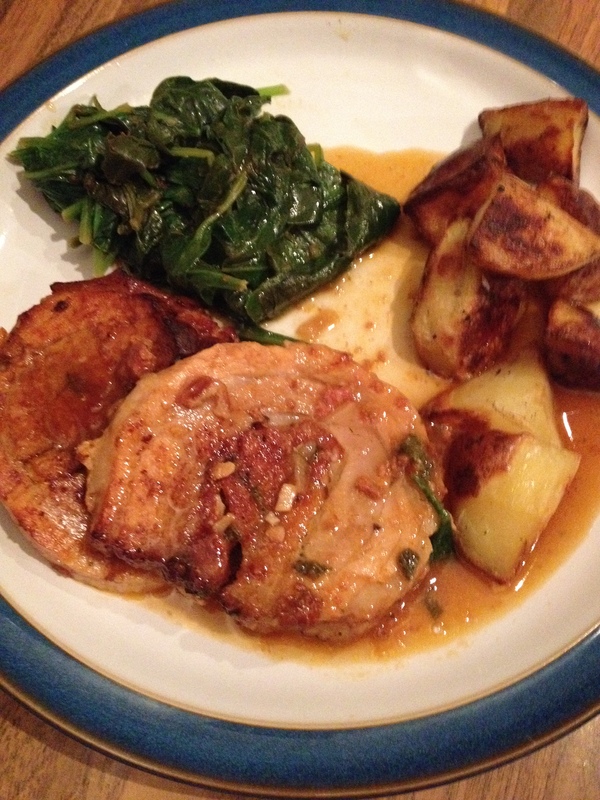 As mentioned the star of the show for me was the pork – my proudest moment – and here as promised is the recipe from Simon Hopkinson. 300g hot cooking chorizo skinned, 8 finely chopped garlic cloves, 2 tbs chopped sage, 1.5kg piece of pork belly boned, 1 teaspoon of hot Spanish paprika, ground nut oil for cooking, 3 large onions sliced, 500ml dry sherry, 10 coarsely chopped tomatoes, salt and pepper, 500 ml of jellied chicken stock. 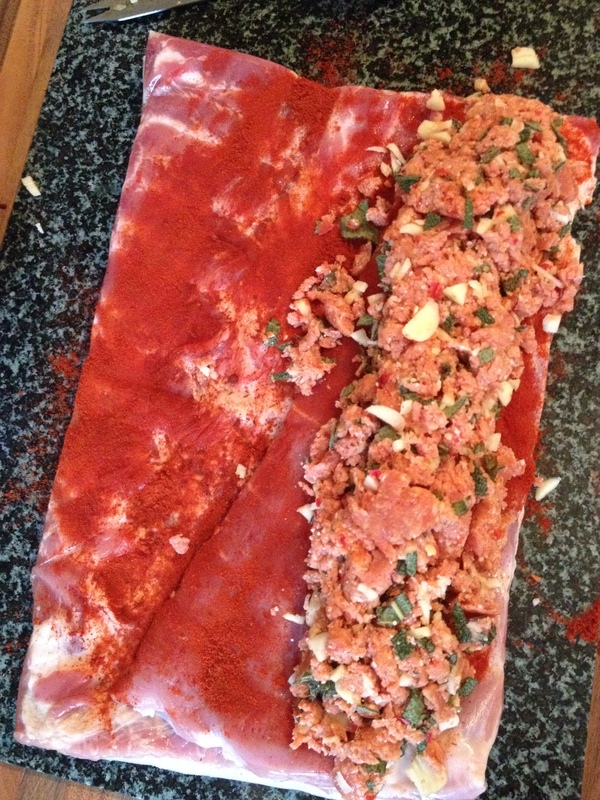 Take chorizo mix and place along the top edge of the pork belly and roll the belly tightly up like a swiss roll. Tie with butchers twine leaving around 2 to 3 cm between each piece of string. Make sure it is trussed up nice and tight! In the frying pan add the onion and cook till nice and brown then deglaze with the sherry. Tip the whole lot onto the pork belly. 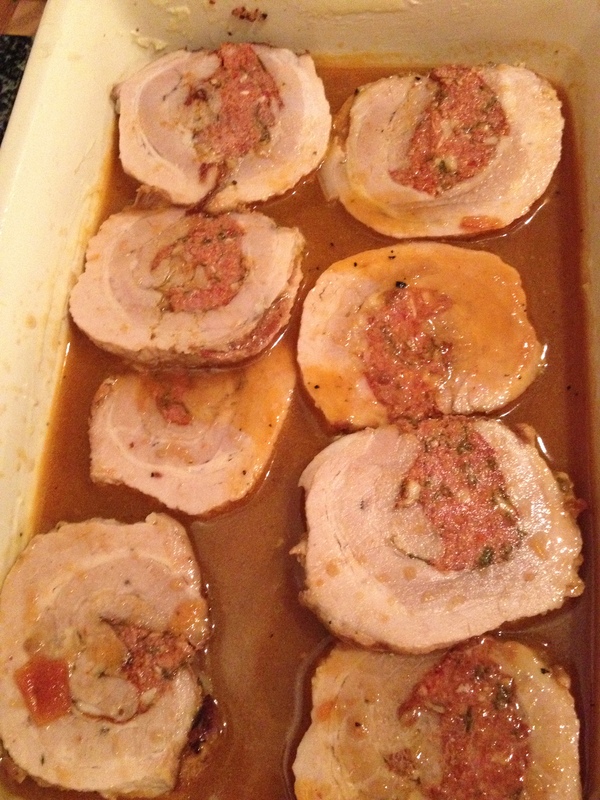 Add the tomatoes and top up with chicken stock to come to 3/4 of the way up the pork. Bring to the boil and then put a lid on and pop into a preheated oven 140 degrees. Cook for 3-4 hours (my 1.7 kg piece took around 5 hours) . You know it is ready when you stick a skewer or knife through and it glides without resistance. Remove the pork belly from the dish and leave to rest for half an hour. Then remove the strings carefully and wrap in several layers of foil to compact it. Leave to cool before refrigerating. Strain all of the cooking juices through a sieve then cool and pop in the fridge. Boil the cooking juices in a pan and allow to reduce a bit then add to the pork. you will want enough juice to come about half way up the pork slices. 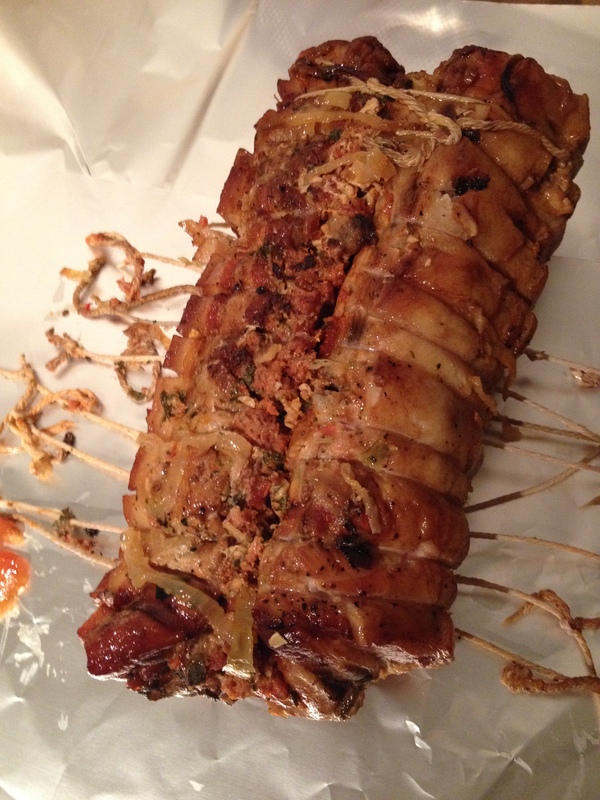 Pop uncovered into a preheated oven at 180 degrees for around half an hour – basting regularly.